I once had a client come to me and her energy repulsed me. The phone call on booking the appointment made my gut churn. How easy would it have been for me to ‘judge’ her as having bad energy and being someone I should steer clear of? It was a horrid feeling. A wise and beautiful Reiki Master once taught me a valuable lesson. She taught that when dealing with energy many books/websites and teachers emphasize “protecting” from negative or bad energy that other people vibrate. This teacher said that sometimes if you are feeling ‘negative’ energy it’s easy to jump to conclusions and say the energy is directly related to the person. The ‘bad’ energy may in fact come from you, it may come from a person the other just had lunch with, it may come from a spirit hanging around or it may come from a past life and yes, it may come from the person for any number of reasons. The most important thing is not to come from ego and tell that person you feel they have a nasty energy or horrible vibe. It’s ego to suggest it’s the other person without knowing where the energy comes from or why. Energy doesn’t lie and that is true but the inexperienced person will automatically jump to a wrong conclusion. This wise mentor suggested that an experienced person who knows the different ways ‘bad energy’s come to be’ will be able to work through what is what and never bring a person down by suggesting they have a nasty vibe. Remember in Reiki we never promote fear and such a thing may cause someone to plummet to a deep low they never had before hearing such a negative thing from you. Be mindful never to promote fear. The woman who came to me – the energy was in fact a great well of grief, so it wasn’t even negative energy but grief which was masking her own joyful energy. I’d suggest never jumping to conclusions and if you feel someone had negative energy – regardless of how experienced or inexperienced you are, you are not always right. If you feel you are right without any room for considering other factors that is ego. If you think you are right because you feel an energy and the client says ‘no’ you are wrong things are awesome for me – DO NOT FORCE your first impression on them, as it’s likely to be something else or some other factor that is yet to be explored. If it’s not a client and someone else entirely it may be none of your business. There is always a duty of care and because we can feel energy does not give us permission to force what we think we feel onto the other – because as I’ve learned we can be wrong and it takes a bit of investigation and counselling and working through… if it’s any of your business in the first place. The energy you feel may be the person blocking you because they don’t like or trust you. There are many reasons. Work through it before you conclude and give your conclusions to the other person. You’ll be a much better practitioner for it. Thank you for sharing this information it is a Great Help. I’ve found that referring to the energy as “heavy” rather than negative puts one on a better position to deal with it. It’s neither good nor bad, it just needs to be lifted. I agree with you, Khrymsun. Yes very true Kikihana, and thanks you for taking the time to read the article and comment. Thanks for the article.some Reiki practitioners like me think every article should be about a meditation,technique or new dimension of energy but the essences of every energy work are somethings like this article. So..perfect timing as usual. Had this feeling of “bad”energy from a new person in my workplace. This gives me the chance to step back and allow whatever is to be unfold and not judge. Thank you for this perspective. Very insightful. Thank you so much!! Hi Tammy….As soon as I saw the information regarding your cards I knew I wanted to purchase them…although when it came to the price you’re asking …I cannot afford them. I’m devoted to my Reiki practice and I’m a Reiki Master Practitioner. I understand energy. I love your cards…sorry your asking price is too high. Thank you Tammy, for this article. I try not to use the term negative because I feel so much judgement is attached to that word. I like the term “heavy” that Khrymsum mentioned earlier. Thank you to Reiki Rays also for all the great articles. Great way to phrase it! Great article!. I once had a healer say I had negative energy. It really took me aback because I was in such a desperate place and I needed help. This person never even took the time to ask pertinent questions. After this experience, I would never say such a thing to a client. The client is contacting the healer because they want to be healed. We are responsible for helping others, that is why we are Reiki practitioners. This comment reminds me of “church ladies”. Healers only wanting to do their work on clients already healed or saintly. Heh heh. If you’re a lightworker than the plan should be transmuting negative to positive. If you don’t know how to do that, apologize and get out of the way. Healing the healed is not, IMHO, what Source Energy had in mind. It’s called light “work” for a reason. The work is in finding the positive in that person or situation and focusing your client in how to build off it despite the negative distractions in their lives. C’mon. Let’s raise the bar. If we harbor true strength, we can do it. Lovely article , Tammy. Very true that as reiki practitioners we need to bring reiki positive energy and healing to those who seem to emit negativity . I had an experience a few years ago with a very negative person ( and she was negative , only spoke ill of everyone and everything), who also was an energy vampire. She latched onto me like a leech both socially and for reiki sessions. I soon realised that I always felt totally drained and exhausted whenever she had been around. 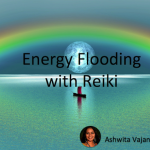 The usual grounding and clearing routines before and after reiki sessions were simply not stopping the outflow of my personal energy to this woman. I took to books again to try to learn more and specially to learn how to shield myself from such a draining person who so badly needed the reiki healing . I did not want to turn her away. She had so much emotional baggage as well as serious physical issues and permanent pain from old injuries. Once I had learned new ways to shield myself and protect myself from being drained by her, she stopped showing up so often and only occasionally comes for a reiki session !!! The healing has helped her with pain, but she still hates everyone and everything except her dogs:) I suspect that people do back away from her because she drains their energy and that’s perhaps why she abhors them for not gifting her their energy. This is a very timely article. Thanks so much! A few days ago I experienced psychic & energetic blockage between my spiritual son & me. After praying & dowsing a number of times, I have a very good idea where it’s coming from. However, all I mentioned to him was that there was a blockage from someone or something that was cutting us off from each other. I don’t like to point fingers. The person might also not be aware that he/she is causing the problem. This does not feel like negative energy or a psychic attack. However, in past experience, I have found that a St. Benedict medal blessed by a Catholic priest has gotten rid of the effect of negative energies & psychic attacks very quickly.